Clio Kaid's had one crazy summer. After learning she was one of a hundred teens who were genetically modified before birth, she and the others departed for "camp" at a classified military site. Besides discovering her own special ability, uncovering a conspiracy, and capturing a killer, she's also forged new friendships, found love, and managed to lose them both. With no answers and the end of summer closing in, Clio's terrified of going home more lost than when she arrived. Will she finally find everything she's been looking for? 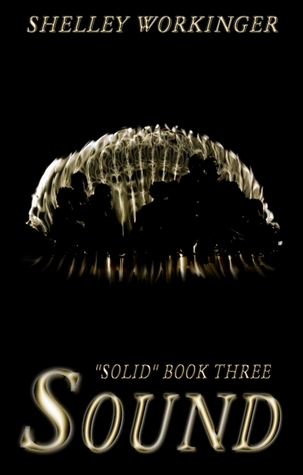 Find out in this exciting conclusion to the Solid trilogy. What a perfect conclusion to the Solid series! I really enjoyed book one, Solid, and book two, Settling, but I think that Sound was my favorite out of the series. It was a close race, though: all three books were great reads in their own right. Not to mention the fact that Workinger provides a descriptive summary at the beginning of each book, thus enabling readers who are new to the series a way to jump right in. I would definitely recommend reading all three books, and reading them in order, of course, but you could read just one book from the series and still understand what's going on. Sound takes place immediately after the events in Settling, book two. Clio is ostracized by her group of friends, because of her betrayal of Jack. Clio had an inappropriate moment with Lieutenant Graham at the end of book two and once her friends found out, they shunned her. The worst part was that Jack does not remember anything about Clio's betrayal. In fact, he can't remember his relationship with Clio at all! Finally, Clio takes ownership of her mistake and is accepted back into her group of friends. I loved the way the conflict resolution between the group was handled. I loved that Clio really owns her feelings and stands up for herself. I also was happy with the way Clio handled her relationship with Jack: it wasn't at all what I was expecting, but it was perfect for the situation. Additionally, I was also pleased with how Workinger resolved the conflict with Lieutenant Graham, especially the part where Clio confesses her indiscretion to Colonel Clark. My one complaint about Sound was that there was a lot of build-up to the actual action sequence in the book. The build-up was necessary, but I would have preferred for the book to be longer and to have more action. I was surprised at the ending---which made me happy---I love to be surprised. I think it was the perfect way for Workinger to end the series. She left things open enough for a future sequel, but closed enough to give her readers closure. I hope there is a sequel sometime in the future, because I'd love to read more about the Solid characters and spend some more time in their world!